← What kinds of strategies suit what kinds of people? It has been a while since my last post. During the last weeks, I have been listening, writing, photographing, watching and discussing with various people about the topic of happiness strategies. After much explorative research I can finally share some of my findings online. Studying scientific literature in the analysis phase of this project has given me the necessary framework of knowledge to base this project on. Naturally, contemplating this information has brought about new questions. Having found out how various happiness strategies may have a positive impact on our lives, I wondered much about the actual adoption of a strategy. How would people follow these strategies, would they be able to adopt them into their daily lives just by reading a book on happiness? Would they have to face challenges along the way? And would their happiness actually increase as a result? 1. Positive emotion. The activities of the strategy should generate positive emotions. These are not short-lived, but contribute to the creation of a habit. 2. Optimal timing and variety. Activities should be timed according to one’s lifestyle and should be varies, to make sure the effect does not habituate. 4. Motivation, effort and commitment. A happiness strategy is not a quick fix. One will have to be motivated and invest time to make it a success. 5. Habit. By turning the strategy into a habit, it will become more natural and effortless. To find out more about the dynamics of adopting a strategy, I conducted explorative research on a small scale, and with qualitative methods. This yielded rich information that was inspiring through its personal touch. I interviewed four people from different life phases and asked them how they experienced happiness, and whether they had any personal strategy to increase or maintain it. I interviewed a second-year student, a graduate student, a senior employed woman and a retired woman. Out of these interviews I made personas that displayed the diversity and complexity of the topic. As it turned out, the interviewees from different life phases each had their own source of happiness. For one it was the experience of flow, for the other it was committed goal pursuit and self-development, yet another could savor ordinary pleasures. This diversity was backed up by a questionnaire I organized among a group of 32 young creative people (mostly IDE students and recent graduates), which were asked to fill in a Person-Activity-Fit Diagnostic (2007). Their top 4 scores were translated into a diagram. The group showed a liking to the strategies of engagement (68% of the participants had this in their top 4) and savoring life’s joys (59%). Among the low scores were developing strategies for coping and practicing religion and spirituality (both came in at 9%). The differences between these strategies are striking. My interpretation is that because of their relatively young age, participants have witnessed little loss or trauma, and are therefore not drawn towards strategies such as coping of forgiveness. Practicing spirituality or religion (soul) is a habit more commonly displayed among people of older age, and not among youths of the Northwest European culture. A hypothesis may be then, that there are correlations between certain life-phase groups and certain strategies, but this would still need to be tested up by a more thorough quantitative analysis. 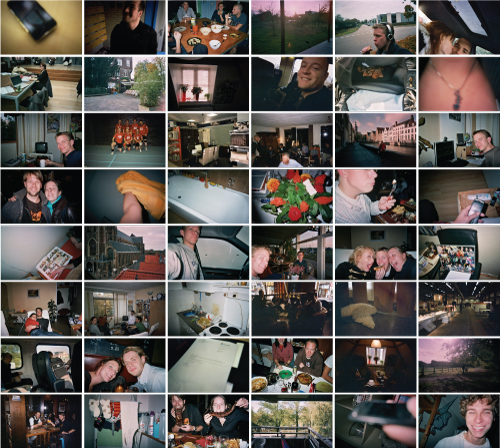 I asked four people to carry a disposable camera with them for two weeks, and take pictures of the moments during which they experienced happiness. This yielded 60 honest, rich and sometimes hilarious photos. When asking the participants to explain their photos, lengthy stories emerged. As it turns out, happy moments were often constructs of different emotions, such as joy, pride and hope. Meeting or surpassing expectations, being positively surprised, finding a funny moment in a dull environment, reaching an anticipated goal, enjoying the company of friends and family, were all themes among the photos. I was surprised for the participants, happiness would sometimes consist of small things, such as the sight of a tree in fall season, the smell of fresh laundry, or arriving home late and finding that your housemates have saved you some of their dinner. To get more insights in the dynamics of strategy adoption, I have followed a strategy myself for two months. 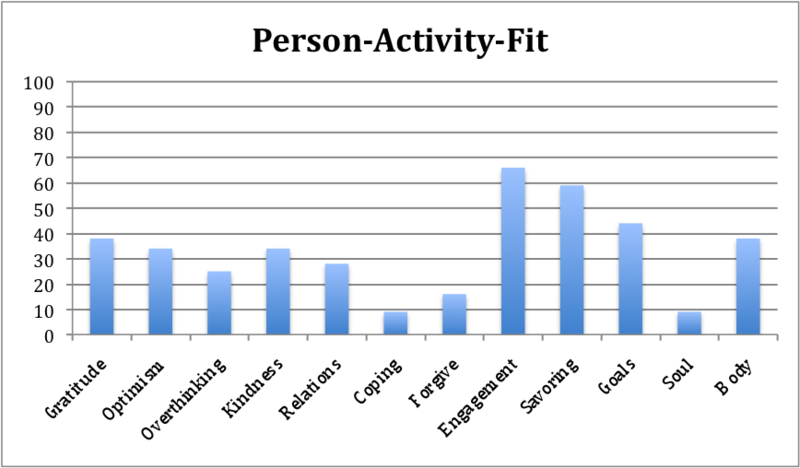 I had completed the Person-Activity-Fit Diagnostic and it recommended ‘practicing acts of kindness’ to be a suitable strategy likely of success. Every week I reserved one afternoon to commit to my strategy. In the course of two months I helped housemates to find items they dearly sought after, improved the shed in the yard of my house, acted as a diplomat in interpersonal conflicts, acted open and friendly towards salesmen, and gave personal presents to friends and family for no reason. This experience gave me a notion of the aspects that play a role in the adoption of a strategy, and allowed me to prepare for what would be the biggest part of my exploratory research. The main part of the explorative research was to try out Lyubomirsky’s strategies. I let 15 participants (mostly young creative people) complete a Person-Fit-Diagnostic, and assigned a strategy to them from their top 2. According to literature, choosing a number 1 or 2 strategy increases the chances of success. I was able to find participants for every strategy except for ‘developing strategies for coping’ (for which an explanation can be read above). For every strategy I assembled a small booklet that contained in brief the instructions and exercises from Lyubomirsky’s book. The also contained some questions and space for writing and drawing. For three weeks, participants followed the instructions and tried to adopt the strategies into their daily lives. Some were asked to think of bright futures, others to savor positive routine experiences, to work on their social relations, or to practice gratitude through writing. After these three weeks the booklets were returned to me, and I was able to interpret and compare them. I hosted two focus sessions, during which I was able to speak to 10 participants about their experience. First of all, the themes that Lyubomirsky deems to be important in the adoption of happiness strategies were verified. Positive emotion, optimal timing and variety, social support, motivation, effort, commitment, and habit were all important aspects that influenced the success of the strategies. Beside these, many other issues came up that can prove to be interesting starting points for design. Sometimes a too good fit of a strategy with one’s normal activities can decrease the potential of that strategy. It is impossible to say whether the participants have received the strategy that is most effective for them. Participants also believed that the value of different strategies is dependant on the situation and mood of a person. There is no ultimate strategy for every person. One conclusion then can be that the Person-Activity-Fit Diagnostic is not always sufficient in assigning strategies to participants. Most participants were very curious of other strategies, and would like to try more. 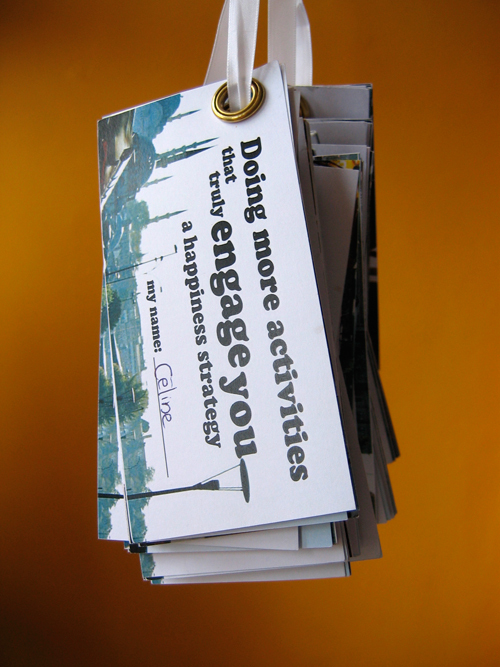 > A toolkit with products that relate to different strategies or aspects of happiness could enable users to experience a variety of strategies, and decide for themselves which ones they would like to adopt. Some participants were triggered to perform an activity for their strategy on the moments on which they felt an emotion related to their strategy (such as expressing gratitude when feeling grateful). However, most participants were triggered by the booklet, which reminded them of their obligation to perform the activities. Some participants even put the book in plain sight on purpose, to remind them of their strategies. Upon seeing the booklet, participants either felt guilty of the activities they still needed/wanted to perform, or proud of the activities they had performed. > A product could provide a trigger that evokes prides and enthusiasm rather than guilt and low motivation. Some strategies stimulated participants to become active and experience new things. Participants found it valuable to be driven out of their ‘comfort zone’. A comfort zone can be seen as a set of behaviors one is used to demonstrate. Being pushed out of the comfort zone can be awkward at first, but will lead to new experiences and new insights. > A product could stimulate activation, and allow the user to step out of the comfort zone. Some strategies enabled participants to contemplate their life satisfaction. Through the execution of the strategies, participants claimed to be more aware of the level and source of their happiness; an insight they valued. They often became aware that the strategies they adopted were already part of their life in some way. > A product could stimulate contemplation. A lot of participants experienced guilt or frustration during the adoption of the strategies. When forgetting about the strategies or failing to execute planned activities, the participants felt guilty. When the activities would cost too much time and effort, or when it was hard to find an activity with which to execute the strategy, they would feel frustrated. It seems to be very important that goals are met. > A product could increase the ability of the user by setting goals that are feasible. Overall, the participants were interested in the happiness strategies. They believed however, that most people would only search for such a product when being unhappy. Unhappy people would have a higher motivation to improve their happiness than happy people. 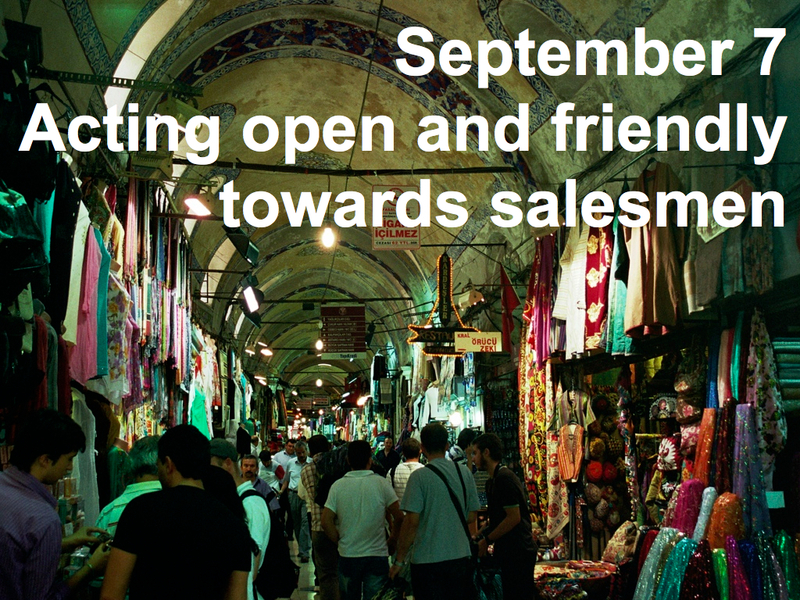 Participants considered mouth-to-mouth the best option for promoting the product. Since happiness is so personal, claims by people one doesn’t know may not be considered to be valuable or true. > A product could focus on personal promotion to increase acceptation. It is obvious and logical that the insights from the explorative research relate very much to behavioral psychology. There are two models that in my mind incorporate the majority of these insights. They are the Experiential Learning model by Kolb (1984), and the Behavior Model by Fogg (2009). The circular model of Kolb shows that effective learning is a continuous process of experimentation and contemplation. Participants lacking either of these elements seemed not to have become much happier. Participants that had incorporated active experimentation and contemplation in their activities had indeed become happier, or more aware of their happiness. The behavior model of Fogg shows three elements that are necessary in order for a behavior to occur. They are motivation, ability and trigger. When one of these elements lacks, a behavior will not occur. This is an interesting model for design, since products can very much influence the ability of a person, and can also provide adequate triggers. In the next phase of this project, these insights will be used as starting points for the generation of product ideas. More to come soon! – Fogg, B. (2009). 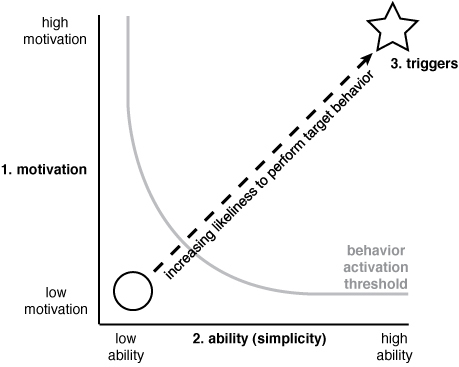 A Behavior Model for Persuasive Design. PERSUASIVE 2009. Claremont: Springer-Verlag. – Kolb, D. (1984). Experiential Learning. New York: Englewood Cliffs. – Lyubomirsky, S. (2007). The How of Happiness. New York: The Penguin Press. Wow, I am super impressed by your approach! could i follow your happiness test/strategy as well? I’m always very aware of my own strive for happiness.. A hedonist, maybe.. What about long term vs short term happiness in your product?